Caption slip reads: "Photographer: Mercurio. Reporter: Ostler. Assignment: Dams ... Flood control. San Gabriel Dam. 107-108: Outlet tunnel area of the San Gabriel Dam No. 1. Visitors Rosemary Northey and Nancy Hunt are seen near guard rail in foreground. Note water from 123 inch penstock valve which gushes at 690 cubic feet a second, a 10th of its opening capacity. 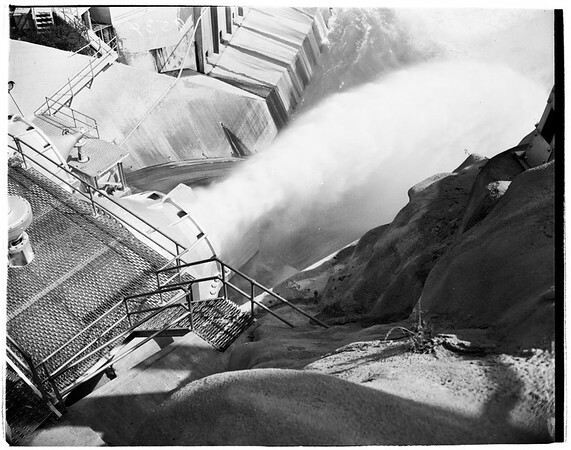 10: General view of Penstock valve of San Gabriel Dam as seen from above. 14: General view of the San Gabriel Dam No. 1 at the tunnel outlet. 13, 206: L-R: Rosemary Northey and nancy Hunt seen coming up the San Gabriel Dam's inner side. 205: View looking down at the 123 inch penstock vavle, the largest in the country, at San Gabriel Dam No. 1".